Catherine’s Health Center improves the health of our community by providing high quality, affordable and compassionate health care to the underserved in our neighborhood. To achieve this we collaborate with health agencies, hospitals, schools, churches, homes for the elderly, service clubs and neighborhood organizations. Catherine’s is a member of the National Association of Free and Charitable Clinics and of Free Clinics of Michigan. Karen Kaashoek, our Executive Director is the Southwest Region director of Free Clinics of Michigan. She is a former state coordinator of that organization and served as president of its board. Open Doors ~ We exist to improve access for those in need of health care services. This may include helping find solutions within the broader health care delivery system. Quality Care ~ We believe everyone deserves to have their health care needs met in a caring and dignified manner. Dedicated staff and volunteers strive to make this place a medical home for our patients. 1993: Prompted by concerns over healthcare access and the working poor, Creston neighborhood organizers discussed establishment of a health clinic. 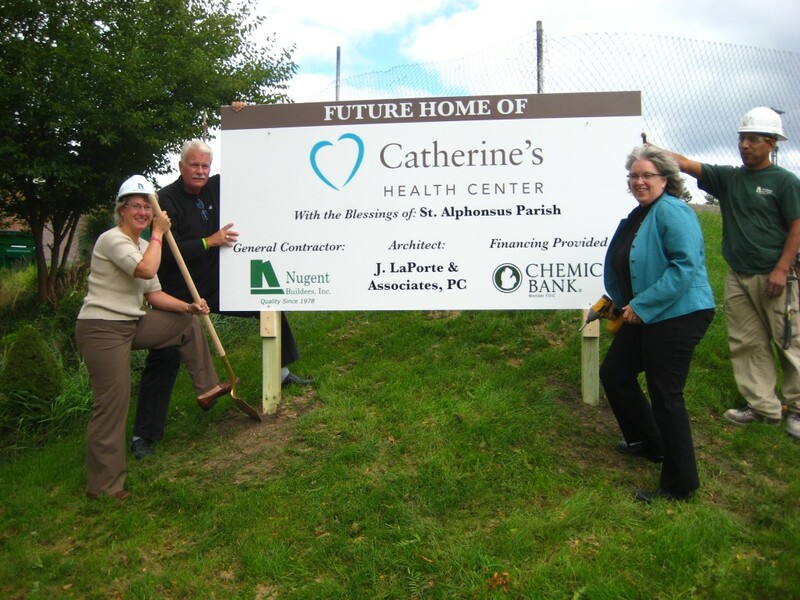 1996: St. Mary’s Hospital, St. Alphonsus Parish, and the Creston Neighborhood Association establish Catherine’s Care Center as a result of these discussions. For the first few years Catherine’s was a nurse-run clinic in the basement of St. Alphonsus Parish. We offered immunizations, health education, and free screenings for children. Saint Mary’s provided intermittent physician support. 2000: Catherine’s offered our first regularly-scheduled physician appointments for free medical services. 2007: Catherine’s obtained 501(c)(3) nonprofit status. 2009: The Opening Doors campaign was begun to raise funds for moving out of the parish basement. At that time we changed our name to “Catherine’s Health Center” to clarify the identity and focus of the clinic. 2011: After much hard work, dedication, and generous support from donors and volunteers, The Opening Doors Campaign exceeded its goal. Catherine’s relocated from its original basement to a LEED® Gold certified, renovated section of the former St. Alphonsus School. This move expanded Catherine’s space nearly six-fold, allowing us to develop new office practices, bring in more volunteers, accept new patients, and increase programming capacity. 2013: Catherine’s received the Torch Award for Ethics from the Better Business Bureau of West Michigan. Catherine’s Health Center provides primary medical services five days a week. With a growing staff and volunteer base, Catherine’s continues to work diligently to provide free and low-cost medical services, completing more than 7,000 patient contacts each year. Anticipating the provisions of the Affordable Care Act, we positioned the organization early on to meet the needs of low-income, disenfranchised people by participating with the navigator program and by partnering with select third-party payers. We are currently monitoring reliable sources of healthcare policy and funding information to remain prepared and to implement any needed changes. Catherine’s continues to rely on the generosity of the community to assure health care for some of its most vulnerable residents. We steward funds carefully and value our relationships with community organizations who offer education, support, and other health-related services.